A former lawyer, she moves purposefully past the trellised cucumbers, a rake in her hand though I can just as easily picture a briefcase full of case notes and legal briefs. She shakes my hand and pulls a couple of chairs into the shade of the rooftop’s big generator – we could be in a law office if not for the streaks of sunscreen on her face and the long purple carrots strewn across the table. They had mischievously seeded themselves in a tomato bed, she explains – rogue carrots! 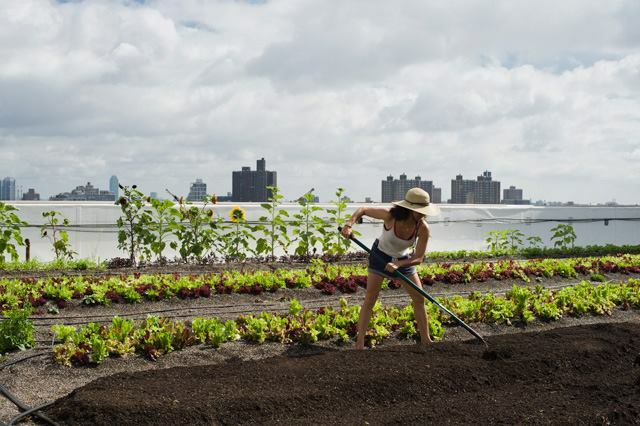 A Brooklyn transplant by way of Connecticut, Alia left the legal world to take up urban farming, a career change that allows her to live out her values every day. She now works as the Grange’s Director of Sales and Assistant Farm Manager, giving tours to visitors and advocating for a healthier, more just food system. With an energy and enthusiasm remarkable for someone who’d been pulling weeds since six in the morning, she spoke with me about her decision to switch careers, the benefits of RIF’s Urban Farm Recovery Project, and the future of the Grange. Could you tell me about your background? Are you a native New Yorker? I’m actually from a small city in central Connecticut called New Britain, which we affectionately call “Hard-hittin’ New Britain.” It’s really small, but it was very diverse, which had a profound impact on how I viewed the world – that, plus my parents. I am the daughter of a Polish immigrant. My mother was born in Poland, and New Britain has a strong Polish community; that’s part of the reason that they immigrated to that location. And then my father, who is ethnically and culturally Jewish, is from New York. You were an attorney for five years before this. So, the obvious question that I’m sure you get asked a lot is when and how and why did you decide to leave that and become an urban farmer. I practiced law for five years. I went to undergrad at Harvard, worked for a couple of years. I went to law school out in Los Angeles at the University of Southern California and then practiced for five years: four in D.C. and my last year here in Manhattan. And I worked at a big law firm. It wasn’t what I thought I was going to do when I went to law school, but it’s what I ultimately ended up doing. It pays well; you graduate with a lot of debt. And you also learn a lot. It’s a phenomenal education, working at a big law firm. But the lifestyle and culture of big law never really appealed to me. I went into law as one of those idealists: “I’m going to make the world a better place, and I’m going to give a voice to people who lack a voice.” But when you work in big law, you’re primarily representing companies and corporations. I didn’t really feel like I was helping the community of individuals that I got my degree for. I love practicing law; it’s so intellectually stimulating. I like the complexity of it, I like the analytical side, I like oral arguments, I like writing briefs, all of that. But I didn’t like the lifestyle. It was all-consuming. I didn’t like the politics, and I wanted to really help somebody else. And so almost two years ago I handed in my resignation, and I was going into work one day, just walking across the Pulaski Bridge, and I thought “All right, what do I want to do next? I don’t want to practice law anymore, I don’t want to practice in-house, I don’t want to practice at a different firm; I’ve done those things.” And so I said, well, what do I talk about all the time to the point that it makes people sick? Something that I clearly like? And for me it’s three things: it’s public education and revising the public education system; it’s fitness and health; and then the third and kind of the primary one, given what I do now, is how we grow, source, and provide our food. Yeah, and it’s insane. It’s really problematic. If you look at other countries, when you have a lack of water, it does not go well. Forget government, forget order, forget civilized society. All these top military figures at the Pentagon have come out and said that climate change is the number one threat to world security, more so even than terrorism. Absolutely. But it’s not as sensationalized. Half of this country for political reasons doesn’t want to acknowledge climate change, and it’s unfortunate that it’s going to get to a point where it’s almost too late before they start realizing that changes need to happen. So, what makes me really happy about working here is this is a very proactive place. So, I was thinking about all this, and I was like “Well, urban farming kind of combines these other things,” right? It’s a very physically intensive job; I do not need a gym membership when I’m working at a farm! I get to be personally really physical and active. There’s also a big education component to it; we have visitors coming up all the time. We have City Growers, which is the non-profit that partners with the Grange that does educational tours for kids K-12, learning all about sustainability, agriculture, bees, seeing things like kale for the first time, planting seeds. And it’s true for adults, as well; I’m constantly having conversations with people and educating them about how we grow, why do we do it this way. And then obviously it is central to how we grow and source and provide food. Yeah! I’ve already resigned, I’m just wrapping up my cases…So I biked over to the Grange, and I was blown away. It was August, it was gorgeous; everything was in full bloom, and it felt right. So I talked to the farm manager there, and started as a trainee for the end of that season, then I came back and worked with the farm all last year and became a fulltime employee this year. And I don’t for a single minute regret leaving the legal practice. The RIF participants in the Urban Farm Recovery Project – some of them have an agricultural background and some of them don’t, but a lot of them come here and they see Americans like yourself and others who have left these prestigious doctor or lawyer jobs to become urban farmers, and it’s kind of hard for them to believe; that’s the type of thing that they’ve left behind in their home country, and they’re trying to become doctors and lawyers in the U.S. Have you experienced that with some of the participants? Yeah, I experience that with the RIF participants, and I experience that with our American trainees, too. Any time I mention to someone that I used to be a lawyer – and then particularly if they learn how much I used to make in that line of work – it’s very shocking to people. But for me, I’ve never really pursued anything individually or professionally based on somebody else’s valuation of how important it is. And I also don’t believe in making a career just based on what you’re going to earn. What really makes something prestigious? What is the value you’re adding? What is your mark on the world? I think prestige comes from the impact that you can have on a bigger scale, on something that’s outside of yourself. So practicing law can be very prestigious for myself and for my law firm and for my immediate friends and family, but farming is something where I can have so much more impact. Organic farming has such a greater impact on things way beyond myself, and that to me is a much more significant goal. I’d rather pursue that every day. Wearing some traditional Burkinabe’ garb at the 2013 RIF graduation. Does that message get conveyed after a while? Especially to the RIF participants; do they start to view what they did at home as more important than they had previously thought? Yeah, I think what really helps it sink in for them is they see how many people come to our farm. We get visitors all the time, from literally all over the world; people will plan their vacation to New York City specifically to come see the farm. And they’ll see political figures from other nations or other states who are interested in learning how to do it. They start to understand…I mean, the government invested money in projects like this, and I think when they see that sort of interest and mobilization, that really helps it sink in. And you know, as they progress and learn more, they’re personally interacting with our visitors. They’ll walk people around the farm and explain things; they’ll hand out CSA distributions. They’re really the ones helping disseminate and communicate the message, and helping other people understand what we’re doing, which inherently means that they get a greater understanding of what’s going on. And I think they really do kind of say “Wow, this is really unique, and this has a really big impact.” And you can actually make a living off of it; they can take the knowledge that they’re learning and actually get a job. So I think that really does help it sink in. I’ve noticed for a lot of them, in their home country it’s something they had to do. Here, this is a reprieve for them. It’s a place of solace. They can come here, and we can all hang out and be friends and talk and support each other, and do communal lunches. It’s not just pulling weeds; there’s something else that’s happening when we’re weeding together, or seeding a bed. And then being able to do it from literally seed to harvest – to take ownership and feel like this is their project, too – I think that really impacts them, as well. 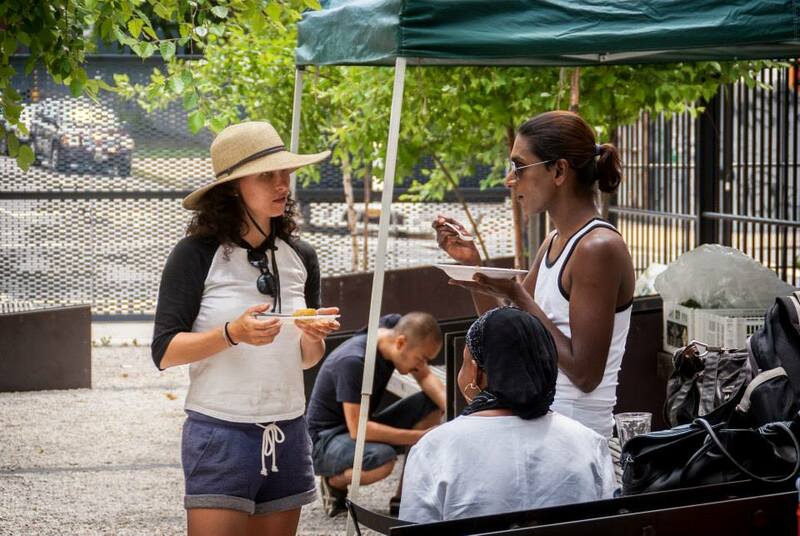 How would you describe the partnership between RIF and the Brooklyn Grange? I think it’s been a really positive partnership and it’s been really impactful for those of us involved. It’s always one of my favorite parts of the year, getting to know the RIF participants. I cannot tell you what a transformation it is, from day one at orientation where everyone’s nervous, and they’re worrying about their English, and they’re not sure who to trust, to literally by the end of the season we are friends and family. Those are the kinds of experiences that you don’t get often, and you really don’t get them a lot as an adult, so to be able to get that every year, personally I’m really lucky, right? We have so many success stories from last year, it’s incredible. People getting asylum, people getting jobs, taking what they’ve learned here and creating their own little side projects from it. And that’s ultimately the point of it. I think there is a very good long-term potential and value here, and the idea is to grow the program, to get more participants, to get better stipends, to benefit more and more participants. RIF is a really unique thing happening here. I mean, it’s unique in so many ways I can’t even explain it. 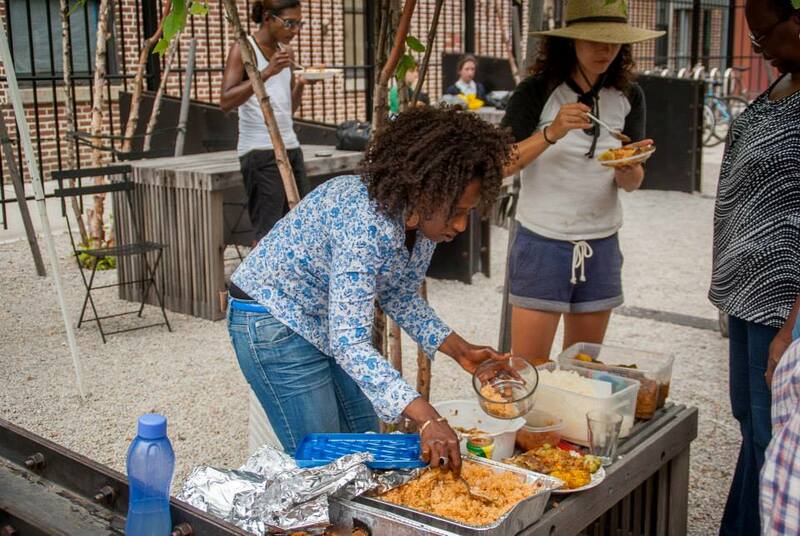 We’re dealing with refugees and immigrants who come from really terrible circumstances, and who are hoping to find a home in their community by working at an urban farm on a roof in New York City. There are so many seemingly discordant things that produce such wonderful results. Alia with Farm Manager Matt at last year’s RIF graduation. Where do you see things going from here, for the farm and for yourself personally? Say, in the next five to ten years or so? Ideally the farm will have a couple more locations. And we have new lines of business all the time, so in five to ten years I wouldn’t be surprised if we’re doing something else in addition to farming and events and consulting. Like, if we have a school, or we have something else entirely that I can’t even think of right now. A Brooklyn Grange charter school up on a rooftop somewhere? Right? These are things I try to think about every day. I think it’ll be interesting to see how the business expands. 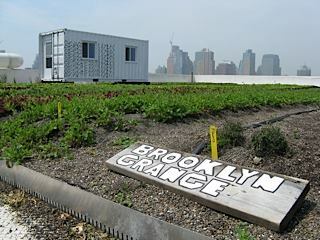 I don’t think it’s going away any time soon, and I think we’ll have a bigger presence in other communities as we help other urban farms start, whether at the ground level or the rooftop level. One of the things that most drew me to the Brooklyn Grange and makes me so proud to work here is that we really believe in what we’re doing. We really believe that it’s important to take care of the environment, to grow responsibly and organically. We really believe it’s important to reach out to the community and help, and to have fun while you’re working. There’s very little ego at this farm. I haven’t worked somewhere where there’s been this little personal ego involved and everybody’s just kind of out to do what they love, do it well and do it in more and more iterations as time goes on.